We hope you've had a great summer! As the season draws to a close, join us for one last celebration with our End of Summer Y-DNA Sale! 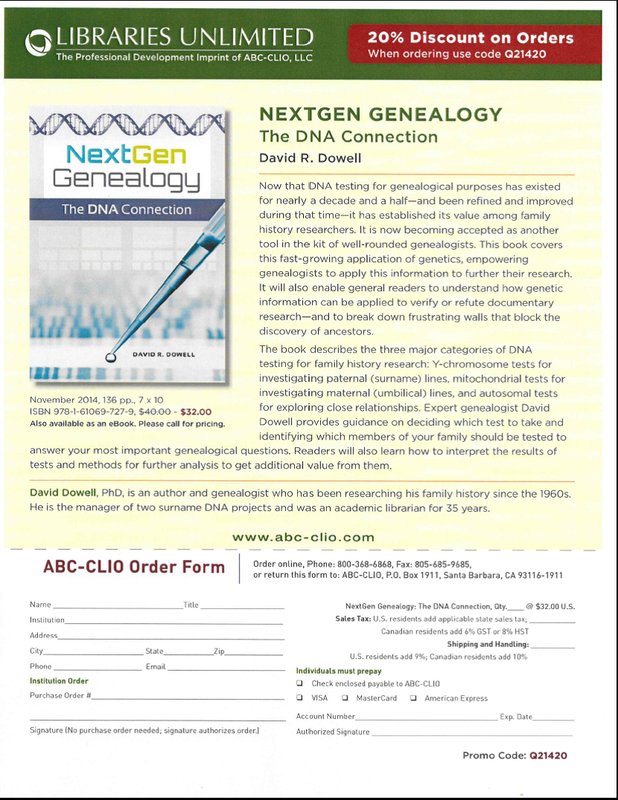 Customers can order a Y-DNA test and join the world's largest Y-DNA database today. 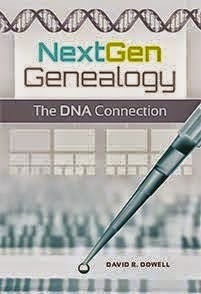 All Y-DNA tests and upgrades have been marked down for significant savings! Time is limited. The sale ends 9/3/2014. As an added bonus, Big Y is also on sale for just $495. Big Y coupons acquired during the Father's Day Sale can be used on Big Y orders placed during the End of Summer Sale. With Big Y, 340,000 years of Y-DNA ancestry is just a test away! The chart above is offered only to give overall perspective. 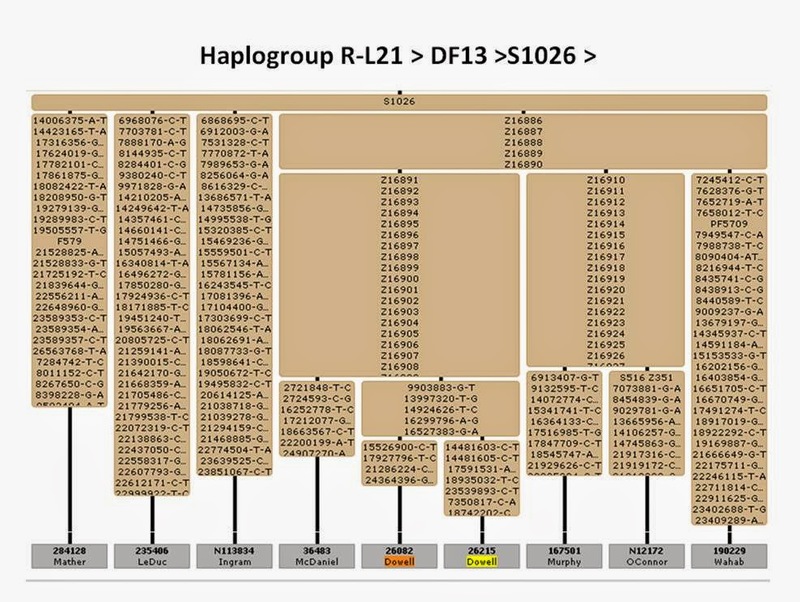 The new subclade R-S1026 discussed in yesterday's post is represented by the four boxes colored pale pink in the middle of the chart. The more robust subclade R-DF49, which includes SNP M222, is the blue/aqua on the extreme lower left corner of the chart. Our Maryland Dowells and the Virginia Dowells have not shared a common male ancestor in about 3,500 years even though both followed the same SNP trail down from yDNA Adam to SNP DF13. You will need to visit the linked project website to be able to read the details of this chart. I request the reader's indulgence to ignore the gold and yellow boxes in the upper right corner of this part of the chart. The Virginia Group 1 Dowell who took the BIG Y test, was able to trace his SNP migration pattern several hundred years and eight SNPs closer to the present. He now is confirmed to be DF97 and beyond. DF97 is at the bottom of the third column from the left in the above chart. Although this Dowell has been able to discover the trail of his ySNPs through a significant part of the last few millennia, he still has discoveries to make to connect his paper trail to his SNP trail. As was the case with my Maryland Dowells, The Big Tree of Alex Williamson gives many more recent SNPs to try to arrange in the proper chronological sequence. It is necessary to visit the original website to get a clear view of the SNPs that the yDNA of this Virginia Dowell has accumulated as his paternal clan moved toward the Atlantic coast of Europe. The Virginia Group 1 Dowell is the third column from the left in the above chart. SNP DF85 is in top row and DF97 is in row three. There are still many SNPs to arrange in the proper sequence in recent centuries as attempts are made to tie the SNP path into the documented path and to identify his nearest relatives. With great haste we make slow progress. I just returned the copy edits for my new book to the editor. Another step closer to the publication date but still a few steps to go. For those of you who have not experienced the process, I'll review it for you. I signed the contract last September. The manuscript was due at the publisher at the end of December. That deadline was missed and my co-author had to withdraw because of success in other areas of her life as a genetic genealogist. It was April before I finished the part she was to have written. First the acquisition editor read the manuscript and approved it to go into production. Then it was reviewed for plagiarism, copyright and legal permissions from those whose material was being included. Here the progress seemed to bog down. I'm not sure whether this was due to an illness of the production editor or because of the cycle adopted by my publisher. The cover was developed as soon as the manuscript went into production. Authors, at least with this publisher, have no say about the cover. We can negotiate almost any other aspect but not the cover. Manuscripts for other books I have done with this publisher were due at the end of December. This allowed the books to be available for showing to thousands of librarians who attend the American Library Association Conference typically held at the end of June. Since the current title missed that cycle, it seemed to fall into the next cycle. That cycle is to get it out in November so that it could be available for Christmas. The production editor assigns the manuscript to a copy editor who reads it for grammar, footnote format, etc. The manuscript is returned to the author for concurrence with any changes and to answer any questions from the copy editor. This is the last point at which the author can make any changes or add new material. The manuscript is returned to the copy editor for final formatting. It is then converted into page proofs. These are returned to the author for one last review. At this stage only the most minute changes can be made so that the pagination will not be disrupted. The index is created at this point. I prefer to do my own indexing. Our work schedule calls for me to be indexing in mid-September. The page proofs and index are returned to the copy editor who places every thing in final form and forwards it to the publisher for printing and distribution. If you should order this book from the publisher, be advised that the electronic format offered was designed primarily for library servers and may not be what you have come to expect from Kindle. The book also can be preordered from Amazon but the discount code shown above will not be honored there. Makes one want to investigate self publishing. For a long time I have been stymied in my efforts to trace my SNP trail through the most recent three or four millennia down to genealogical time. Now we are beginning to make some headway due largely to the herculean efforts of the citizen scientists of the R-L21 and subclades project. The BIG Y, Full Y, Chromo2 and other discovery tests are providing multiples of the numbers of SNPs that had been identified prior to the beginning of 2014. 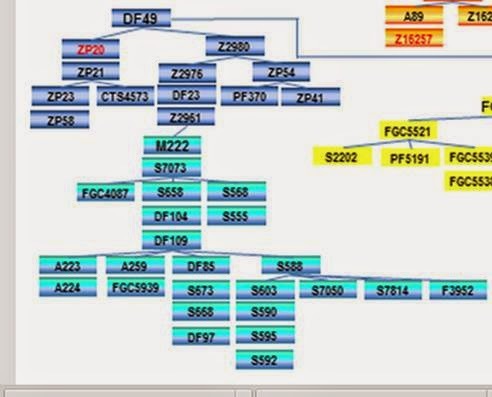 This chart lists the SNPs for each of us that have been discovered downstream (toward the present) from S1026. At least six men have been identified by the Chromo2 project at ScotlandsDNA. My results are those in the middle column above. The man whose results are my closest match in the SNP chart above (just to the right of mine) is a sixth cousin-once removed. He and I share 105 of the 111 short tandem repeats (STRs) over which we previously had been tested. We appear to share five SNPs that so far separate our migration trail from that of any of the other members of this emerging group. He and I share a common ancestor who died in Southern Maryland in 1733. Even more recently I have four additional SNPs and he has seven. The McDaniel man represented by the SNP trail in the column to my left above is my next nearest relative in this grouping. He and I previously had discovered we shared 35 of 37, 64 of 67 and 102 of 111 STR markers. He has seven identified SNP mutations since his ancestral DNA trail separated from mine and that of my Dowell cousin. The three of us share nineteen additional so far identified SNPs in common before our common trail merges with that of the three men in the columns to our right. Then the six of us share five earlier SNPs before we converge with others with whom we share SNP R-S1026. are grouped together but we don't know in what chronological sequence they occurred. Only as more are tested and some are positive and others are negative will this more precise arrangement be possible. 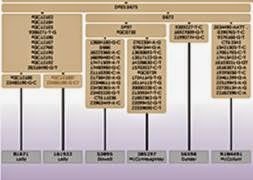 This sorting of other SNPs which are lumped together above will follow a similar process. As a result the SNPs will appear to be out of sequence as their correct ages and thus their actual locations along the migration path of our paternal DNA begin to appear. This will result in the nice orderly naming progressions to be scrambled. 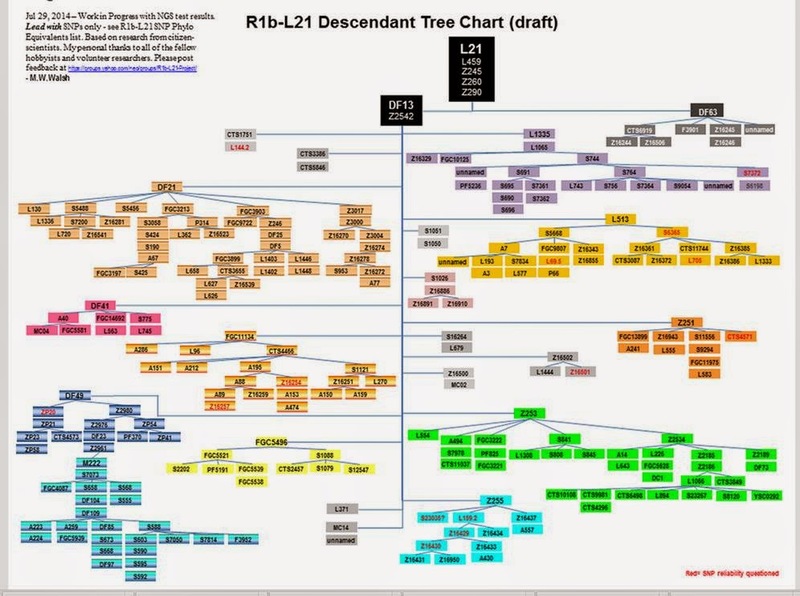 Isn't genetic genealogy fun? The more we discover the more we have yet to learn.